Fire Emblem: Mystery of the Emblem (ファイアーエムブレム　紋章の謎, Fire Emblem: Mystery of the Emblem) is the third installment of the Fire Emblem game series, developed by Intelligent Systems and published by Nintendo, and released only in Japan. It was remade in 2010 for Nintendo DS as Fire Emblem: New Mystery of the Emblem: Heroes of Light and Shadow, itself also unreleased internationally. 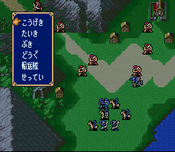 Gameplay of Fire Emblem: Mystery of the Emblem. The game takes place on the continent of Archanea and stars Marth, one of the series' representatives in the Super Smash Bros. series. 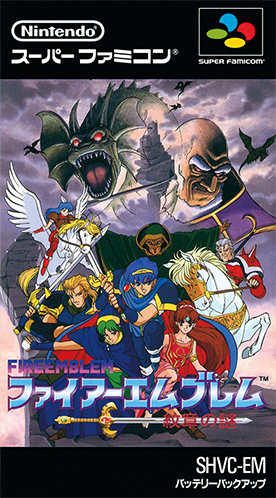 The game is made of two halves, or "books": the first book, the "War of Shadows", is a compressed remake of the Japan-only Fire Emblem: Shadow Dragon and the Blade of Light, the debut of both the series and Marth which was later remade again as the internationally-released Fire Emblem: Shadow Dragon. The second book, the "War of Heroes", is a completely new sequel to the story of the first book; colloquially, mentioning this game is often taken to refer to the second book alone. This game appears as a Masterpiece in the Japanese version of Super Smash Bros. Brawl. It can be played for 180 seconds. The only representation this game gets (aside from the masterpiece) is three stickers in Super Smash Bros. Brawl, as well as a medley of different tracks from the game in Super Smash Bros. for Wii U, where it plays on the Coliseum stage. However, Marth's appearance in Melee and Brawl is inspired by his official artwork for this game. Mystery of the Emblem is the only Japan-exclusive Fire Emblem title listed in the North American release of Brawl not to receive an English translation, being listed under its Japanese subtitle Monsho no Nazo. Super Smash Bros. for Wii U, however, uses the Mystery of the Emblem translation. This page was last edited on November 22, 2018, at 22:46.